Mexicans celebrate Easter in considerable style with processions and re-enactments of religious events. The MexConnect Easter Index page has a varied collection of articles and photo galleries relating to the Easter period in Mexico. Easter procession in San Miguel de Allende. Photo: Don Fyfe-Wilson. All rights reserved. Easter celebrations have been held for centuries in many of Mexico’s towns and cities, though the details may have changed over the years. 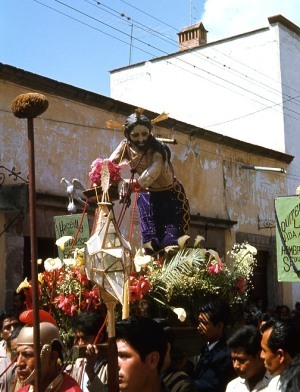 This MexConnect article, for example, features photos from a Good Friday procession held in San Miguel de Allende in the mid 1960s. The festivities in dozens of villages and towns throughout the country, including Tzintzuntzan in Michoacán and San Cristóbal de las Casas in Chiapas, have a very long history. Perhaps the single most famous location in Mexico for witnessing Easter events is Iztapalapa near Mexico City. See here for photos of the 2013 Celebration of Easter Week in Iztapalapa. Note: This post was originally published in April 2010, updated in April 2014 and republished in 2017. The geography of Mexico’s religions is analyzed in chapter 11 of Geo-Mexico: the geography and dynamics of modern Mexico; many other aspects of Mexico’s culture are discussed in chapter 13. Walking the edge of Mexico City Kimo Sabe mezcal: is it too good to be true?